My favourite writer of all times once said: “I don’t believe in ageing, I believe in forever altering one’s aspect to the sun”. I don’t know whether this sentence makes much sense to the modern woman of our time who is more concerned about crease lines, dynamic expression lines and gravitation folds rather than finding her spot under the sun, but for me, I learned quite early on to differentiate beauty from ageing when looking myself in the mirror. Smooth wrinkle-free skin doesn’t necessarily mean beautiful and equally, beautiful doesn’t necessarily mean young or perfectly proportioned. What I always strive for when stealing that moment to look in the mirror, is a healthy, vibrant face and body. I strive towards a refreshed and vital glowing skin and not necessarily perfectly done make up or fuller lips, blow dried hair and chiseled cheekbones. This means that I care a lot more about what’s on my plate and how much I exercise than having the perfect manicure and skincare. Yet, there comes a time when you know that taking care of yourself internally has to be backed up with the proper skincare products, perhaps some supplements and a well groomed look. And when it comes to skincare, in the times of the beauty cult we live in, it is never easy to choose what’s right. There are so many factors beside what you want for your skin. You need to consider the environment you live in, the seasons and climate change, and even your stress levels. So as much as it is about your self-esteem and how well you think of yourself, it is also about being able to raise your confidence from the outside to the inside: feeling good about the skin you live in. 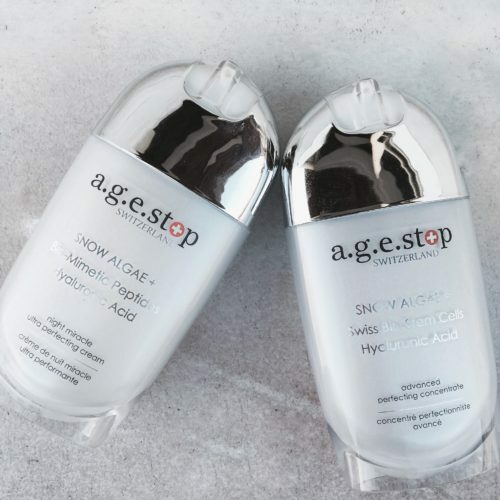 Once I passed the age of 35 I tried a new product on the market called Age-Stop. Not that I believe that you can stop age, but I do try to keep my mind open, so I tried a product with a fairly impressive list of ingredients on the label, such as Swiss Snow Algae, Royal Epigen P5, Matrixyl® 3000 and Swiss Alpine Plant Stem Cells, which have won numerous international cosmetic awards as the very best ingredients in anti-aging science and skincare. Two years after I tried the Perfection Concentrate I keep buying it and it turns out it is the one cosmetic line I’ve stayed loyal to for years. The product has now become a best seller worldwide and soon the line will consist of four products, and three more products are being developed as we speak. Tsitaliya: How did it happen that you started making your own serum Age-Stop? In other words why did you start producing AGE STOP PRODUCTS. Lilia Bassi: Since the age of 17 I have had a life – -long ambition of producing my own Skincare line of products targeted towards anti-aging, I have had 3 fails on the way before AGE STOP PRODUCTS products became a Success in Switzerland and World-wide. Tsitaliya: What is the biggest myth about ageing? Lilia Bassi: For me the biggest myth about ageing is that genes play the biggest role in how you age. Not true. Even if you’re born with the healthiest set of genes, how you live your life determines how they behave over your lifespan. Your genes can be changed by what you eat, how much physical activity you get, and even your exposure to chemicals. Tsitaliya: In what way women can slow down the process of ageing of the skin? Tsitaliya: You also are a beauty blogger – for how long, tell us a bit about your story of becoming an entrepreneur?! Lilia Bassi: I have been blogging for about 4 years. But I have always been an entrepreneur and with my commercial banking background it was only a matter of time until I started on the path of my life -long dream of owning my own Skincare Brand. In short, I have always aspired to be the next Estee Lauder. Blogging was just a way for me to share my knowledge. None of my blogs are sponsored -hence my viewers value my honesty as I say what I really think of the products I try. This month you can buy any of the A.G.E. Stop products using the code mumsinheels, which gives you 20 USD discount per product. If you buy two products you will have 40 USD discount or three in a set 60 USD discount.